Posted on Tue, Jan 24, 2012 : 5:55 a.m.
Editor's note: The story has been updated to correct the day of the meeting. The American Civil Liberties Union of Michigan, the Student Advocacy Center and the Dispute Resolution Center joined forces Monday to persuade schools to consider alternatives to discipline and to provide students with the resources they need to remain in school. The ACLU also is preparing to launch its next research endeavor looking at local discipline policies and asked members of the community to email their suspension or expulsion stories to education@aclumich.org. The push will begin in about 10 days, said ACLU field director Rodd Monts, and will include the organization’s social media sites as well. Amir Alexander, a student at the University of Michigan, originally attended Monday’s Student Rights and Responsibilities Forum to support her mom, so she was surprised when she found the topic intriguing and was compelled to ask questions and participate in the discussion, she said. Alexander recalled being suspended more than once during her K-12 education. She could not remember the root cause, she said, but she eventually received the out-of-school suspensions after a series of small offenses that led to larger consequences each time. Monts described this model of discipline as “progressive discipline.” He said its use contributes to the gap between the number of black, special education and economically disadvantaged students that are expelled or suspended each year and the number of white students expelled or suspended. Progressive discipline also has set the stage for the school-to-prison pipeline phenomenon that exists, he said. Monts said 3.5 million students are suspended annually across the country. To help prevent unjust suspensions or expulsions that take children away from school, he said students must know their rights and responsibilities, hence the purpose behind the forum. Washtenaw County education committee member for the ACLU, Carmelita Mullins, discusses the local research the American Civil Liberties Union has done at Monday’s Student Rights and Responsibilities Forum. Monts gave attendees a stack of cards outlining these student rights — the right to know the offense one is being accused of, the right to explain oneself and the right to see the alleged evidence against oneself. He encouraged the audience to pass them out to as many students as possible. Margaret Rohr of the Dispute Resolution Center described some of the conflict mediation services her organization provides, such as for conflicts regarding students’ special education plans or attendance problems. Rohr said the Dispute Resolution Center also has seen a direct link between school attendance mediation and fewer school dropouts. Colleague Claudia Young said conflict resolution is especially important in instances of suspension or expulsion because otherwise, when a disciplined child comes back to school and has not had mediation, the conflict still exists and the behavioral problems are more likely to continue. Monts said implementing peer mediation programs is a great alternative to discipline at schools, however it can be costly. 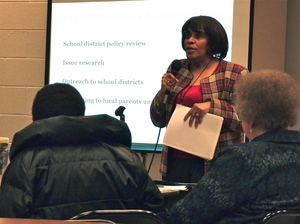 Ann Arbor Public Schools Superintendent Patricia Green also spoke during the forum about her plan for improving Ann Arbor’s discipline policies. Click here to read the story. Wed, Jan 25, 2012 : 9:29 a.m.
@smokeblwr--Don't go to Saline. They'll make you say the Pledge. Tue, Jan 24, 2012 : 10:11 p.m. Wed, Jan 25, 2012 : 11:25 a.m. So, the solution falls squarely on schools? Their responsibility is primarily to educate. Not to undue years of neglect that most certainly occurred outside of school hours. When faced with class sizes of 35+ students, even a small number of these poorly socialized louts can interfere with lessons. Innocent bystanders suffer the consequences. Tue, Jan 24, 2012 : 2:11 p.m.
&quot;The ACLU also is preparing to launch its next research endeavor looking at local discipline policies and asked members of the community to email their suspension or expulsion stories to education@aclumich.org&quot;. I hope that the teachers and/or principals responsible (sic) for the suspension will be given the opportunity to add to the students' stories. That's it. I'm moving to Saline. So, instead of requiring students to follow the same rules as the rest of the 90% of the student population we should set up alternatives? And who will fund this? The ACLU? Ridiculous. I work in another school district and let me tell you, these students are not summarily suspended. There is a long line of incidents prior to the suspension, both documented and undocumented, calls to parents and requests for their support in resolving the issue. It starts with little things and the student is counseled long before the first write up occurs. Administrators do not want to suspend students out of school. That is the final step they have to take to allow others to be able to learn without the distraction of the student who needs constant attention. Those students should have the &quot;right&quot; to have that educational environment. Will the ACLU take up that case? I agree with Will. If you post your unjust circumstance, please also post your record so we can see both sides and the long paper trail that led up to it. It seems like this meeting was a justification meeting to come and learn why it isn't your child's fault they disrespectful and undisciplined. Peer mediation as an alternative to discipline? Sorry you got caught Johnny, please go talk to Suzy about how it made you feel and then go back to class? Tue, Jan 24, 2012 : 1:19 p.m. If progressive discipline is wrong, maybe we should go back to good old fashioned swats for misbehavior. If a student can't understand that continually getting into trouble results in greater punishment, then a good sting on the backside might open their eyes. Enough of this coddling. Kids and parents need to know the rules and the consequences. Parents need to lay the law down for these kids. If this results in a &quot;gap&quot;, then it is not the system's fault, it is the student's fault. Stay out of trouble, stay in school. Tue, Jan 24, 2012 : 12:40 p.m.
ACLU is the problem here not AAPS. Tue, Jan 24, 2012 : 12:21 p.m. In 1969, I wrote that students should not be compelled to carry ID cards. When I was called to the office, I was asked to produce my ID, and when I did not, I was sent home. Tue, Jan 24, 2012 : 11:14 a.m.
Any guess about how reliable a self-report about your suspension circumstances might be? What about the incidence of egregious misbehavior and bullying that DOES NOT result in even the minimal penalty-removal from the classroom?